Snowflake and Matillion partner so enterprises can easily load, store and transform all their data in a single, cloud-built data warehouse. Leading cloud data analytics solution providers enable single source of truth. SAN MATEO, Calif. – January 22, 2018 – Matillion ETL, a powerful ETL/ELT tool, and Snowflake Computing, the data warehouse built for the cloud, today announced a new partnership to make the process of extract, transform, load (ETL) on Snowflake fast, easy and affordable. 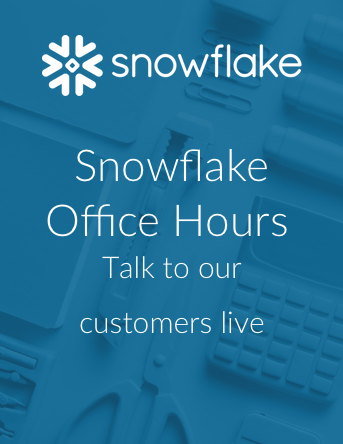 Joint customers can now load data into Snowflake from a variety of sources, including databases, APIs and common systems such as Google Analytics, Salesforce, Netsuite and SAP. Customers can also directly load semi-structured data such as JSON, XML and Avro. These newer data types, when integrated with structured data, can lead organizations to make the most informed business decisions. Traditional ETL methods to extract, load and transform data are often complicated and costly to implement, delaying crucial time to value for organizations. Unlike modern solutions designed for the cloud, on-premises systems and “cloud-washed” versions of these legacy systems can also be expensive and difficult to scale. Available immediately, Matillion ETL for Snowflake makes it easy to rapidly orchestrate and automate data loading and transformation. Snowflake and Matillion deliver Snowflake’s built-for-the-cloud data warehouse that architecturally scales compute separate from storage to deliver a truly elastic, performant, flexible and affordable solution. Matillion delivers a highly-integrated data integration tool, purpose-built for Snowflake, that loads and integrates structured and semi-structured data, transforming that data for organizations to quickly derive insight. Matillion is a modern, powerful ETL/ELT tool that makes data loading and transformation fast, easy and affordable. Matillion is fundamentally changing data integration, enabling customers to innovate at the speed of business, with cloud-native data integration technology that solves individuals’ and enterprises’ top business challenges.